The Republic of Botswana is a multi party democracy and became independent on the 30th of September 1966. Geography - Botswana has a surface area of 581,730kms - roughly the size of France or Texas. It is landlocked by Namibia, South Africa, Zimbabwe and Zambia. The country is 84% covered by the Kalalari (Kgalagadi) Desert. Population - 2006 population estimated at 1.85million with a growing rate of 2.4% per annum. Most of the population is settled in the east and south east of the country and is heavily weighted towards younger age groups. About 43% of the population is younger than 15 years of age. Over 50% of the population have settled in urban areas. People - The Bastwana are the most numerous people in the country, forming about 78.2% of the population and speak the Setswana language. (Batswana also refers to citizens of Botswana). The oldest ethnic group is the Basarwa (or San). Languages - The official language is English, which is used in government and business affairs. Setswana is the national language and is widely spoken. Other ethnic groups speak their own languages. Visas - Visitors from the European Union, most Commonwealth countries and the USA do not require visas. Visitors from other countries should check with Botswana embassies or consulates. Those not requiring visas just get a passport stamp upon entry to the country and do not require any paperwork upon entry. Visitors requiring visas should apply in advance as it is likely that they will be refused entry if they do not have them prior to arrival. Visas are initially granted for 30 days and may be extended for a total of three months. Visitors from Ghana, India, Nigeria, Pakistan and Sri Lanka require visas - as do other countries not listed here. Chameleon Holidays and Travel cannot be held responsible for clients arriving without visas, it is the clients responsibility to ensure they have the correct visa upon entering the country. Economy - When Botswana became independent it was considered one of the poorest countries in the world but the discovery of diamonds in 1967 changed all that, it is now one of the wealthiest non-oil producing countries on the African continent. Its mineral wealth - diamonds, copper/nickel, soda ash and coal, along with the beef industry and the growing tourism industry are the main economic successes. Least we should forget the amazing wildlife and birdlife! 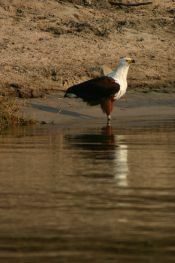 - Some of the very best game viewing and wildlife is here in Botswana. The main difference in the distribution of large game are the huge numbers of elephants, hippos and lechwe along with other water dependent game plentiful in the northern wetlands. In the Kalahari, antelope such as eland, gemsbok, springbok and red hartebeest occur in large numbers but are absent in the north. Predators are common everywhere and include lion, leopard, cheetah, brown and spotted hyaena and wild dog, with little or no fencing in some of the parks its not unusual to get "up close and personal" and camping at night time can be exhilirating! There are some 550 bird species in Botswana and some regions are superb for bird watching. There are no endemic species but several such as the slaty egret, brown firefinch and natal nightjar have restricted regions in the Okavango, Linyanti and Chobe river systems. Okavango Delta - The Okavango is a labyrinth of lagoons, lakes and hidden channels covering an area of over 17,000 square kilometres and the largest inland delta in the world. Trapped in the parched Kalahari sands it is a magnet for the wildlife who depend on the permanent waters of this unique feature. The Okavango, which originates in the uplands of Angola to the north-west, flows into and then spreads over the sandy spaces of the Kalahari to form an immense and wondrous inland delta of lagoon and labyrinthine channel, palm-fringed island and fertile floodplain. 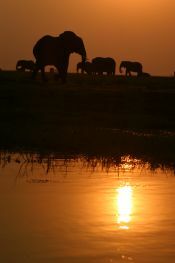 A number of safari lodges and camps have been established in and around this watery wilderness. This wilderness and the nearby game-rich Moremi Game Reserve and Chobe National Park reserves, offer the visitors the best of several worlds, appealing to the game-viewer and bird-watcher, the sporting fisherman, the explorer of hidden places and the lover of Africa in its loveliest and least spoilt state. Chobe National Park - The 10,566 sq km Chobe National Park in north-west Botswana and is the countries third largest, with one of Africa"s largest concentrations of game. The park is divided into four eco-systems and regions The Serondela area of the park features lush plains and dense teak forests, its close to the Chobe River in the extreme north-east and attracts animals (and humans) in abundance during the dry season. Owing to its location close to the Victoria Falls and the town of Kasane it"s the most popular region. Guests are normally able to join river cruises and game drives and see huge populations of elephants as well as predators. The Savuti Marsh in the west is a relic of an ancient lake. Savuti is often considered one of the best all-seaon game viewing areas in Africa but is a little more difficult to get to for the average tourist travelling through, the rewards are certainly worth the effort The Linyanti Swamps in the north-west located alongside the Linyanti River, feature riverine wookland as well as lagoons and floodplains. The swamps are excellent for game viewing and there is also a strong emphasis on bird-watching. This region can be difficult to reach during the rainy season The hot, dry hinterland between the three is mostly covered in nogatsaa grass woodland. Also rarely visited it is a good place to see eland. All major species can be seen in the park - giraffe; elephant; zebra; impala; tsessebe; roan; sable; wildebeest; kudu; buffalo; waterbuck; warthog; eland and predators such as lion, hyaena and jackal as well as the less common cheetah and wild dog (not forgetting leopard too.). In particular Chobe National Park as a whole is famed for its abundant but migratory, elephant population thought to number around 120,000. The elephants move as far as 200km from their dry season habitat around the Chobe and Linyanti rivers to the open pans in the south-east of the park, where they disperse after the rains. Salt Pans Makgadikgadi Pans - A complex of pans and the tarred road between Nata and Maun separate the main areas. 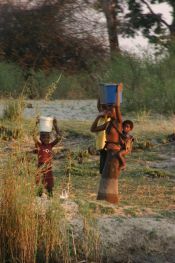 The Makgadikgadi is mainly found south of this road and the largest pans are Ntwetwe and Sowa Pan, the smaller ones being Kudiakam and Nxai Pan (situated in its own National Park), north of the road. Laying at about 1000m above sea level on the great African Plateau the Reserve is approx 6,800square kilometres and is in the northern stretches of the Kalahari. During years of good rain, all or part of the pans fill attracting abundant wildlife and hundreds of thousands of water birds alerted to the presence of water (how do they know when the water is there??) Flamingos come to breed from the coastline of Namibia and other areas, as well as pelicans and herons. The pans and desert endure an extremely hot, dry and harsh climate most of the year; dust bowls and dust devils (mini cyclone) carry the dust into the atmosphere and can be seen for miles. The pans seem to stretch endlessly and mirages appear though often the haze turns out to be a wandering oryx. Not far behind are huge herds of zebra, wildebeest followed by lions and other predators that follow the migration. 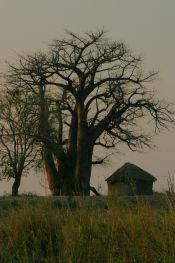 Both man and animal in this sparse vegetation seek shelter under huge baobab trees. Lodges and camps are often located on the edge of the pans and you can spend a night sleeping under the stars or perhaps have an excursion onto the pan aboard a quad bike. However, during the rainy season when the pans have flooded (or partly so) some activities may not be possible The salt pans are not to everyone"s liking - there is too much harshness and solitude for some, but for others the lingering smell and isolation lives on.